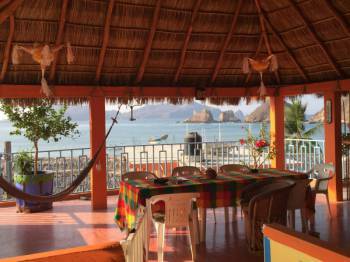 Relax in one of our bungalos and find your home away from home in beautiful San Patricio/Melaque, Mexico. 3-Bedroom suite on the ground floor (sleeps 6 in 1 double, 1 queen and 1 king bed). 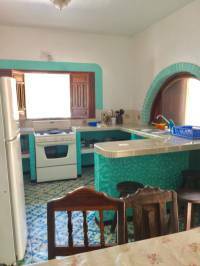 Full kitchen including: fridge, 4-burner stove, oven, microwave, blender, toaster oven and coffeemaker. Dining and living area with a TV. The back door opens onto the shared shaded courtyard with sitting area. All bungalows have wifi, a private bathroom (sink, toilet, shower) and a flat-screen TV. * Prices subject to change. Discounts for longer stays and prices negotiable for May, June, September and October. Add 25% to price for 2 week periods around Christmas and Easter. The dining area. The door opens onto the shared shaded courtyard (photo in Additional Photos). Studio suite on the ground floor (sleeps 4 in 1 double and 1 queen bed). Full kitchen including: fridge, 4-burner stove, oven, microwave, blender, toaster oven and coffeemaker. Dining and living area with a TV. The back door opens onto the shared shaded courtyard with sitting area. There is an additional sitting area out the front door. The kitchen and dining area with the door opening to the shaded courtyard (photo in Additional Photos). The sitting area. The front door opens onto a small patio looking onto the street, and ocean beyond. 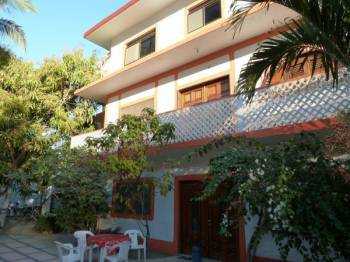 2-Bedroom suite on the second floor (sleeps 5 in 1 queen, 1 double and 1 single bed). 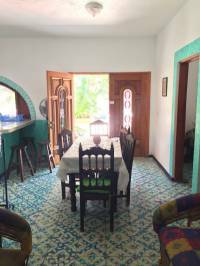 Full kitchen including: fridge, 4-burner stove, oven, microwave, blender, toaster oven and coffeemaker. Dining and living area with a TV. There are balconies at the front and back of the suite. Studio suite on the second floor (sleeps 2 in king bed). 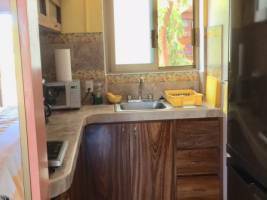 There is a breakfast nook and kitchenette including: fridge, one induction hot plate, microwave, blender, toaster oven and coffee maker. This is the only unit with air-conditioning and a smart TV. Enjoy the view on your private balcony. The eating/writing nook (there is an additional eating area on the balcony). 1-Bedroom suite on second floor (sleeps 2 in double bed). Full shared kitchen including: fridge, 3-burner stove, microwave, blender, toaster oven and coffeemaker. The kitchen is shared with La Rana. Dining areas are separate. Enjoy an ocean view! The bed and ocean-view window. The kitchen is shared with La Rana. The dining area beside the shared kitchen. 1-Bedroom suite on second floor (sleeps 2 in queen bed). Full shared kitchen including: fridge, 3-burner stove, microwave, blender, toaster oven and coffeemaker. The kitchen is shared with La Iguana. Dining areas are separate. Enjoy a mountain view and outdoor sitting area! The dining area. 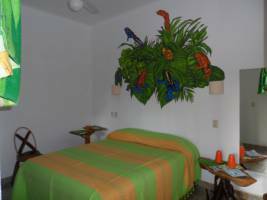 The kitchen is shared with La Iguana (photo in La Iguana room details). Studio suite on ground floor (sleeps 2 in double bed). Kitchenette including: two-burner propane stove, fridge, microwave, blender, toaster oven and coffee maker. Eating area is on the patio outside the bungalow in the shared shaded courtyard. How do I travel around Melaque? Is there room service and will the bungalos be cleaned? Can everyone use the third floor palapa? Can I cook and eat in the bungalos? Are there restaurants to eat out at? How can I make phone calls? 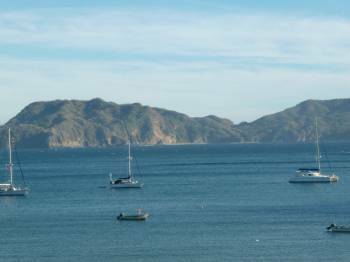 The easiest way to arrive in San Patricio/Melaque is by flying to Manzanillo and hiring a taxi to Melaque (about $600 pesos). 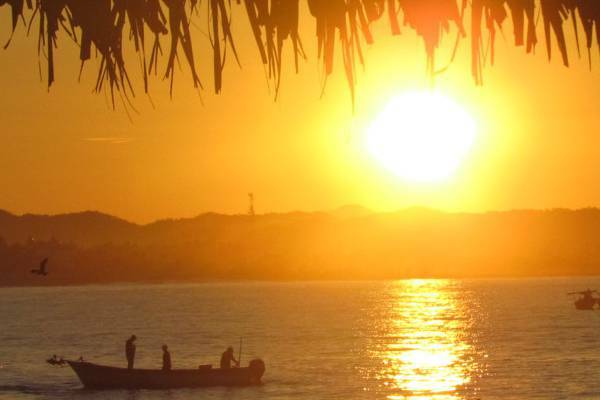 We are located at the far west end of the bay beside Hotel Bahia. If you fly to Puerto Vallarta, you can take a first class bus (de primero classe) from the terminal north of the airport for $260 pesos. First class buses from companies like Autocamiones del Pacifico and Primero Plus leave Puerto Vallarta at 8 am, 12:15 pm, 4:30 pm and 7:30 pm. Local transportation (orange urbanos) costs $7 pesos to go to Barra de Navidad or across town until 9:30 pm. Take the big green bus for $10 pesos to go directly to Barra or Cihuatlan. Taxis are inexpensive and convenient (trip to Barra costs $80 pesos). We have bicycles for guest use; they are free for 3 hours or less. You can rent the bike for $100 pesos/day or $500 pesos/week. 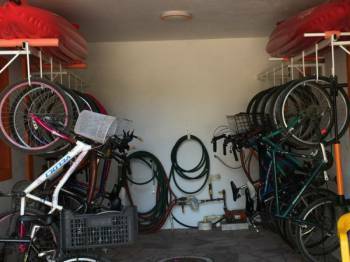 Please bring your own bike locks for long-term rentals. We accept cash, Paypal, Western Union and bank transfers. We do not accept debit or credit cards. There is no room service. The bungalos are cleaned every two days and sheets and towels are changed regularly at your request. Our on-site cleaning and maintenance staff (Emilia and Jacques) can assist with any issues you may encounter. We fumigate at the beginning of the season, but all living things thrive in the tropics! You may hand-wash your personal laundry at our wash station with your own soap or use one of the many laundromats in town. In Mexico, it is customary to tip the cleaning staff. Some people leave a larger amount at the end of their stay, while other people leave smaller daily amounts. A reasonable daily tip is $10 to $20 pesos. Yes! Please use the third floor palapa. It has the best view in the village and it is for everyone's use. 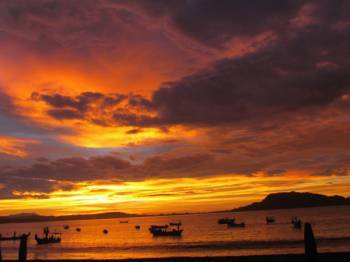 The sun rises are magnificent and it is a wonderful place to enjoy morning coffee or afternoon happy hour. The tap water in the bungalos is not safe for drinking. However, your bungalo will have a full 20 L water bottle on the day you arrive; this bottled water is safe. Every morning, water delivery trucks pass by, honking horns. Whistle or wave and they will replace your water bottle ($20 pesos). Let them come in and do the heavy lifting. To keep our room prices low, we ask that you buy your own water throughout your stay. If the delivery person climbs stairs, please tip him/her. Yes! Your bungalos are equipped with cooking facilities. Fresh fruits and vegetables are abundant in Mexico. And, being on the Bay, we have access to fresh seafood caught daily. There are several good grocery stores in town. Note: soak fruits and vegetables in a few drops of Microdyn and drinking water. We supply your first bottle of Microdyn; you can buy more at the local grocery or pharmacy. For fish, you can either go to one of the Pescaderias in town or walk across the street to the fishermen's co-op and buy directly from the fishermen when the boats come in around 8 am. Or, as a fun activity, arrange a fishing trip for up to 6 people with Gerardo (Gerry, 315-354-2257), who has the fishing charter boat Hakuna Matata. Gerry speaks English, and in high season you must book well in advance. There are numerous restaurants at our doorstep or a short taxi/bus trip away. Canadians and Americans may find your meals out of sync with Mexico. Twelve noon and 6 pm are between meals here. The main meal is between 2 and 4 pm. The restaurants across the street offer good meals (mostly seafood) at reasonable prices. They are open during the day for the main meal. There are some open for breakfast after 9 am. In the evening you can find delicious traditional Mexican food downtown. 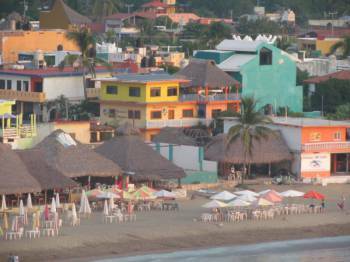 Or, take a taxi or bus to Barra de Navidad for more restaurants. 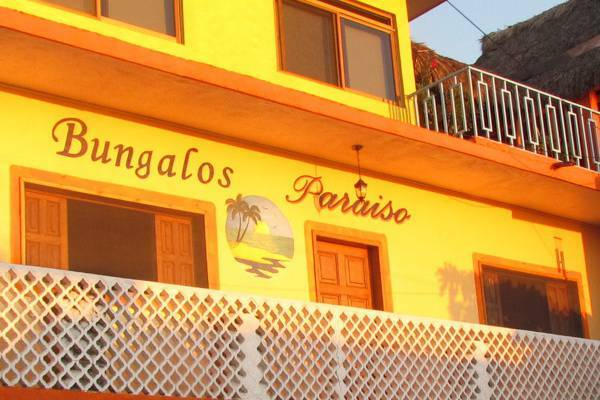 The bungalos have password-protected wireless high speed Internet. Individual bungalos do not have phones. There are phones on each floor of the building which can be used for local numbers (taxis, etc. ); if you call a cell phone from one of these phones you must dial 044 before entering the number. For example, to call my cell phone from the laundry phone, dial 044-315-110-7730. For long-distance communications, consider using e-mail or Skype. You may leave my personal telephone number with family and friends for emergencies only (011-52-315-355-8952). If you bring your personal cell phone, you can buy a local SIM card for about $250 pesos. Plans with data and long-distance calling to Canada and the US cost about $200 pesos/month. There is a new clinic, Public Health Centre (Centro de Salud 355-5880), that has free medical services. There is a 24-hour private clinic (Salud Integral Costa Alegre 355-8722) with English-speaking doctors. Dr. Antonio Pimiento Woo and Dr. Eduardo Pimiento Woo are excellent dentists. Many Canadians choose to have their yearly cleaning and fillings in Mexico where the service is good and the prices are much cheaper than Canada. There are many massage therapists, but I recommend Rosa (cell: 315-114-1062). A massage costs about $450 pesos. 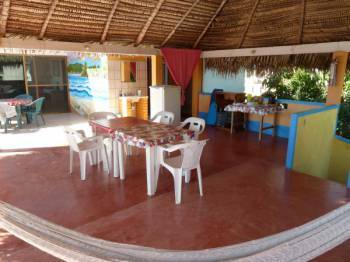 There are many excursions to choose from, such as: fishing (Gerardo 315-354-2257), Isla Navidad, Tenacatita for snorkling (Ray 355-6667), ATV adventures (Ray), and longer tours of giant turtle reserves, Monarch butterflies, coffee plantations, and shopping offered by ECO-tours. There are also a number of walking hikes right from the bungalos. Note: don't forget your sunscreen, sunglasses and hat on your adventures! 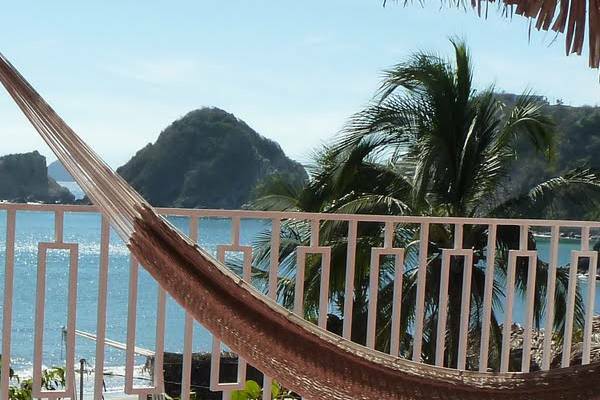 Our charming boutique hotel will keep you returning to the beautiful Bay of Melaque, Mexico. You will be steps from the ocean where you can swim, snorkle, kayak and paddleboard in the warm bay waters. Enjoy sunsets on our rooftop patio or relax in a shaded hammock while you sip your coffee and take in the sunrise - the colors are spectacular! We are located at the west end of the Bay with numerous open-air restaurants at our doorstep. To request a reservation or if you have any questions, please contact us. We have recieved your information, . You will receive a confirmation email at this address shortly. Please try submitting the form again or email us directly at marian.nadler@gmail.comf. 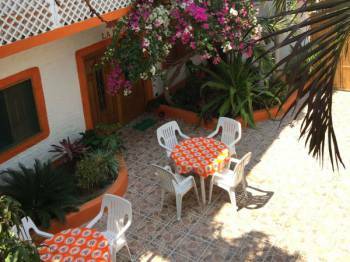 If we are not able to accommodate you, make sure to check the availability at the Hotel Bahia next door!